You wouldn’t think a movie about burglar alarms would be exciting, would you? Well, 1937’s Night Key certainly is. A suspenseful crime / drama centered on alarm systems it also gives star Boris Karloff a chance to play one of the more sympathetic characters of his career. Inventor Dave Mallory (Karloff) has created a new burglar alarm, a wireless device that, if implemented, will revolutionize the entire industry. Fearing he may take this invention to a competitor, Steve Ranger (Samuel S. Hinds), owner of the Ranger Protection Service and Mallory’s former business partner, arranges to “buy” Mallory’s newest creation. Despite the fact Ranger swindled him out of a small fortune 20 years earlier (it was Mallory who designed Ranger’s current system, yet when the time came to patent the idea, Steve Ranger’s name was the only one listed on the paperwork), Mallory agrees to the deal, signing a contract that gives Ranger the exclusive rights to his wireless system. But when Ranger again tries to swindle him (he bought the device not to produce it, but to keep it from seeing the light of day), Mallory decides to take matters into his own hands. Using another invention of his, a contraption he calls the “Night Key”, Mallory is able to neutralize Ranger’s system, and with the help of career crook Petty Louie (Hobart Cavanaugh), proceeds to make a fool out of his former partner by easily breaking into buildings his company is protecting. Unfortunately, the Night Key works a little too well, and before long, the criminal underworld is after Mallory and his device, hoping it will help them rip off some of the biggest businesses in town. With its smart script (penned by John C. Moffitt and Tristram Topper), Night Key brings some excitement to the world of burglar alarms, first by taking us inside an alarm company to show us how it all works (considering this was the late ‘30s, the technology involved was damn impressive), then by focusing on a man who’s found a way to bypass these alarms, who just so happens to be the guy that designed them in the first place! As Mallory, the great Karloff plays to his strengths, providing the movie with a likable lead we always root for, no matter what he’s mixed up in. Even when he’s using the Night Key to sneak into one business after another, we sympathize with Mallory, in part because he never once steals anything (though his accomplice, Petty Louie, does lift a few items along the way). Mallory’s sole purpose in committing these “crimes” is to embarrass Steve Ranger, who’s just as crooked as Petty Louie except that he hides his crimes in contracts and back-room deals, passing it all off as “good business”. Actor Samuel Hinds turns in a strong performance as the deplorable Steve Ranger, and I smiled every time Mallory and his Night Key made a fool out of him. 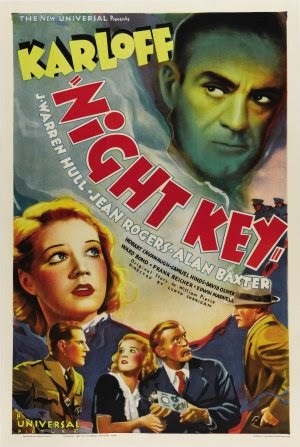 Yet as engaging as Night Key is early on, it becomes twice as thrilling the moment Karloff is abducted by a crime lord known as “The Kid” (Alan Baxter, turning in what is undoubtedly the film’s weakest performance), who forces him to use the Night Key device to commit actual crimes. And even though some of these later scenes adhere to the standard formulas, like when The Kid and his goons threaten Mallory’s daughter Joan (Jean Rogers) to get the inventor to cooperate, Night Key remains, at all times, a surprisingly intense motion picture.